You may have heard about the Utah elementary school that took lunch trays away from kids whose lunch accounts had negative balances, after a Salt Lake “nutrition manager” came in to investigate why so many accounts were in arrears. This bean counter is now on leave, and the cafeteria manager and workers are being blamed for handling the directive badly. Yes, they let the kids build up the negative balances, so they could EAT THE SAME LUNCH as the other kids. And then they scrambled to apply what is reportedly district policy, because in Utah authority is generally not questioned, no matter how wrong-headed it may be. Apparently the system can’t identify account deficits until the tray of food is at the register, which is stupid. That’s Uintah, my old grade school, in the news. I went there in the old building, which was condemned and rebuilt long ago because it had asbestos everywhere. Now it’s being condemned for the actions of asshats in authority. 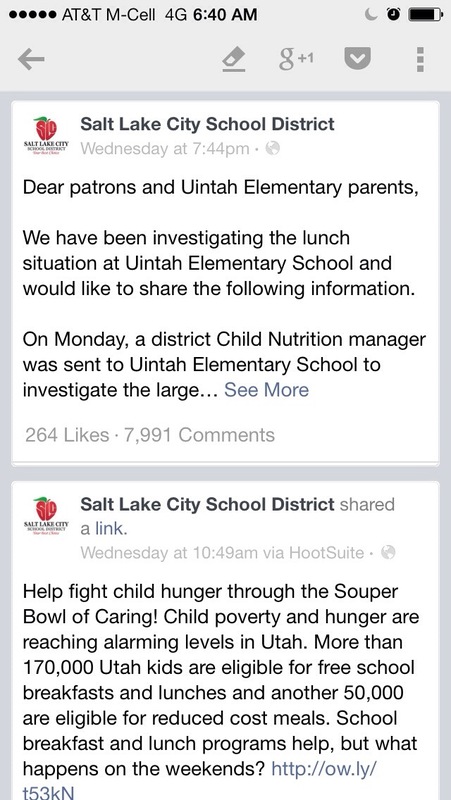 Meanwhile, the Salt Lake Unified School District has some damage control to do, as this screenshot of their Facebook page has their upbeat “Souper Bowl of Caring” post immediately before their response to the Uintah “Cheese Sammich and Banana of Shame” incident. Or was it the “No Souper Bowl of Uncaring For You, Hungry Child” incident? This entry was posted in Dear Mom, Hot Off The Presses, Only in Utah... by ginny. Bookmark the permalink.